The Berks History Center is throwing a party! The Magical History Tour, Part 6 will be held on Saturday, August 18th, from 2:00-10:00PM, at The Evergreen Club, 415 Hartz Road; Fleetwood, PA 19522. 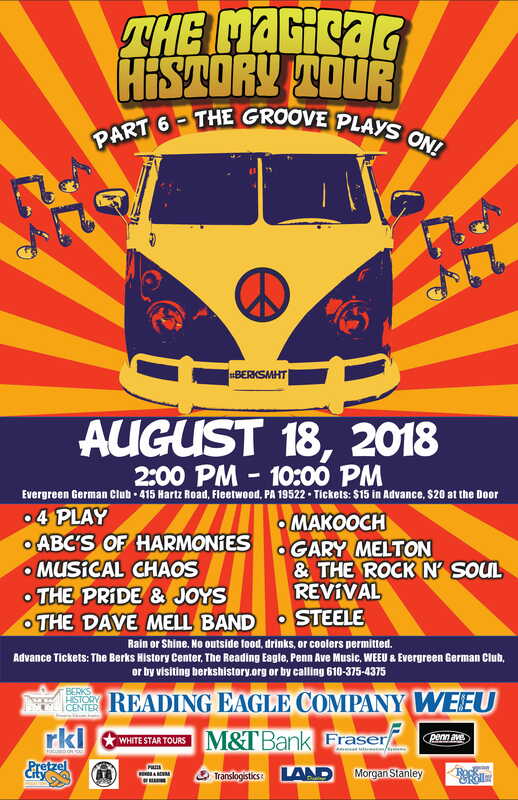 Magical History Tour is an annual gathering of local musicians, both those who played in bands in the 1960s-1970s and current acts, who will perform at a ‘Woodstock-like’ music festival. The Berks History Center is holding this event as a celebration of Berks County’s rich history with contemporary music & culture. Tickets are $15.00 in advance and $20.00 at the gate. Magical History Tour 6 is a great opportunity to bring people of all ages together in an atmosphere of peace, love, music and understanding! We hope that you are able to join us to share your special products and crafts with an audience of approximately 1200 party-goers. As a vendor your company will also be included in event promotions. Sell your Products, Crafts, and Art at the Magical History Tour! The cost is $45 for a 10ft. designated space. Sell your groovy stuff, but no food items please! Please bring your own table. We will include one additional event ticket for your helper. We ask that you plan to vend from 2:00 – 8:00PM. You may stay longer if you like; the event runs until 10:00PM. Please be set up and ready to vend by 1:30PM. If you would like to join us this year, contact Elise Mock at 610-375-4375 or elise@berkshistory.org or click here for a Vendor Application. Mail completed registration forms along with your payment to Berks History Center; 940 Center Avenue; Reading, PA 19601. Once approved for vending make checks payable to Berks History Center. You will receive confirmation once your payment is received.